Contains: Barley, Celery, Soya, Wheat. Potato Starch , Maltodextrin , Palm Oil , Onion Powder , Sugar , Vegetable Fat (Palm) , Wheat Flour (with Added Calcium, Iron, Niacin, Thiamin) , Salt , Tomato Powder , Spices (Paprika, Cumin, Turmeric, Black Pepper, Chilli Powder, Cayenne Pepper) , Flavourings (contain Celery) , Yeast Extract (contains Barley) , Garlic Powder , Flavour Enhancer (E621) , Colour (E150c) , Emulsifier (E322) (contains Soya) , Spice Extract . 1 For 4-6 servings put 4 heaped dessert spoons in a measuring jug. 2 Add boiling water up to the 250ml mark. 3 Stir until it thickens - and that's it: so simple! 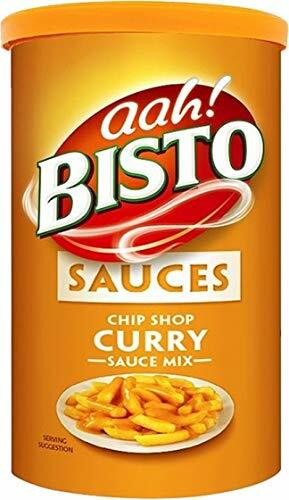 Great on chips!